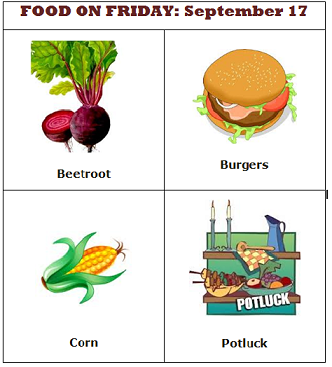 As you can see, there are 3 new themes – Beetroot, Burgers, and Corn. In addition you can add anything else you would like as part of the Pot Luck category. I'll be pinning your creations to the relevant Pinboards – Beetroot, Burgers, and Corn – as well as popping the Pot Luck dishes onto whatever other Pinboards seem most relevant. The link up will be open for the rest of the month and right up to when next month's Food on Friday begins. You can link in something for each category all at once or over the course of the month – whatever suits. There will be a reminder post each Friday and some features each Thursday in my Need Some Inspiration series. It would be lovely to see you adding things throughout the month – maybe every Friday even – set yourself a reminder! This week, I'm offering a recipe for classic beetroot borscht - old school style! I left one recipe for each category! Although the sliders are a vegetarian take on a burger and not per se traditional. Thanks for the invite, Carole! I linked up corn buying tips, facts and recipes! Looking forward to some new recipes! Always on the lookout for new potluck recipes! I'm not sure if I've shared this avocado, corn and tomato salad before, but I brought it. Maybe a second time, lol. Hi Carole, I left my tater tots and a burger too!